If you have any further question, please contact to your local federation. Dive like your shadow, do not leave any trace and be a sensible part of the underwater world, not an alien. Never enter the water through reed, living corals or water plants. Keep distance from corals and other animals and do not stir up sediment. Take care where you drop your anchor during boat dives. Do not chase, touch or feed wild animals. Do not spearfish for fun and do not buy or collect any souvenirs such as corals and shells. Be very careful when diving in caves. Bubbles or any simple contact may destroy delicate life. Learn about the underwater life and avoid any destruction. Urge your buddies to follow these rules too. 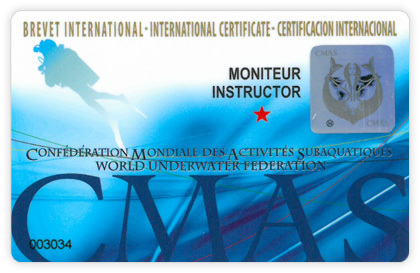 Get to know the CMAS International Diver Training Certification System by reading the General Requirements. Consider and Choose a Dive training progamme by using the dive training map or the finder box. Download and read the related documents. Contact to your local federation to get to know more informations about the Dive Training Programme you choosed. The CMAS has developed a CMAS International Diver Training Certification System that consists of Diver, Speciality Diver, Technical Diver and Leadership Diver Training Standards and which allows divers,that have been trained in accordance with the prescribed CMAS International Diver Training Standards, to have their certifications recognised throughout the world in countries that are members of the CMAS family of divers. The CMAS has developed a CMAS International Diver Training Certification System that consists of Diver, Speciality Diver, Technical Diver and Leadership Diver Training Standards and which allows divers, that have been trained in accordance with the prescribed CMAS International Diver Training Standards, to have their certifications recognised throughout the world in countries that are members of the CMAS family of divers.